Michy Batshuayi did it all on his own for Crystal Palace to draw them level in their FA Cup clash with Watford on Saturday afternoon. 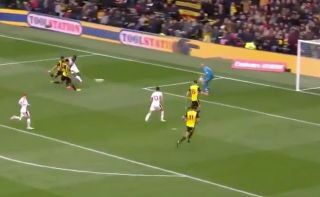 The visitors had fallen behind at Vicarage Road through Etienne Capoue’s opener, but Batshuayi was on hand to find an equaliser in the second half. As seen in the video below, the Chelsea loanee produced a brilliant passage of play, not only in terms of winning the ball back with his hard work out of possession, but also to have the pace, strength and composure to break free and produce the finish. It was a quality effort from the Belgian international, although it remains to be seen whether or not it now inspires Palace to keep their FA Cup hopes alive. They’ll have to come from behind again in order to do so, as Andre Gray scored within minutes of coming off the bench to restore Watford’s lead.